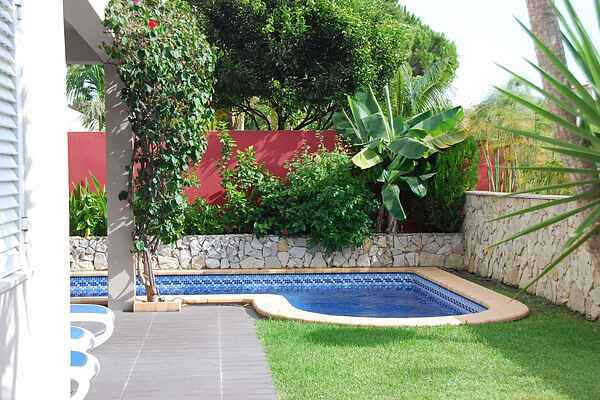 Lovely villa, at walking distance from the old center (500 m) of Vilamoura. Lovers of Portuguese food will be in their element here with a range of lovely restaurants. But don't forget to take a tourist train to the modern marina (2.5 km). This is THE place to admire the luxurious yachts, to saunter along the wide boulevard and to enjoy sitting on one of the terraces as you make plans for the rest of your holiday. A day trip to Albufeira (20 km) should be one of your options. This once peaceful fishing village is still beloved for its car-free center and maze of narrow alleyways, countless lovely squares, shops, and terraces. The lovely beach of Praia dos Pescadores has become one of the most photographed spots in the Algarve thanks to it lovely sandy rock formations. A stunning car drive to the village of Paderne (18 km) will bring you to the ruins of a Moorish castle. From the castle you look out across a beautiful medieval bridge and the River Quarteria, which dries up during the summer months. Next to the river or underneath the castle you'll find lovely picnic spots in the undisturbed natural surroundings. Fancy knocking a ball about during your holiday? Head to the 18-hole Old Golf Course (1 km), a course with real allure! Supermarkets and restaurants are just 500 m away. Comfortable villa with beautifully decorated interior. At the center of which is the lovely private swimming pool (6 x 4 m, depth 0.70 - 1.80 m) with outdoor shower. Here you will also find a partly covered terrace with loungers. On the side of the villa is a surprising area with a wide terrace, stone BBQ and large dining table. A fantastic spot for dinner. Cosy living room with comfortable lounge area, flat-screen TV, DVD, stereo (radio/CD), open fireplace, dining table, and sliding doors that lead out onto the terrace. Separate, light kitchen with dishwasher, microwave, fridge/freezer and washing machine. Separate toilet. Upstairs: Bedroom 1: double bed. En-suite bathroom with shower and toilet. Bedrooms 2 and 3: each with two single beds. Bedroom 2 has a TV (only for playing DVDs). (Second) bathroom with bath, separate shower and toilet. All bedrooms have access to the balcony. Separate (fourth) toilet. Air conditioning in the living room and bedrooms. Parking space on your own, enclosed area.